Mayor Nick Sacco and Library Director Sai Rao hosted “Rhythms of India” at the Nutrition Center on Friday, May 27, 2016 featuring a touring troupe of skilled dancers and musicians direct from India. Guru Smt. 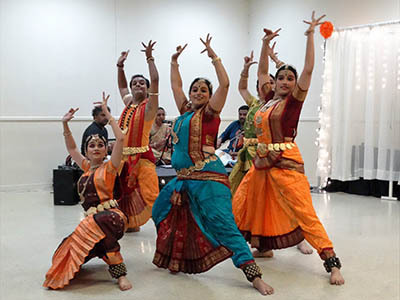 Pamini Radhakrishnan is the founder-director of the dance institute Soundarya Natya Kalalaya in Mumbai, with branches in the U.S. She choreographed and narrated the North Bergen performance while five dancers acted out colorful, highly expressive storylines. Accompanying them were a violinist and a percussionist playing a mridangam, a traditional double-headed drum. Also dancing at the event were talented North Bergen residents Rita Tahika Antony and six-year-old Ishitha, both of whom received enthusiastic receptions from the large crowd that turned out for the entertaining and enlightening cultural event. Visit the North Bergen Free Public Library website regularly for information on exciting upcoming events.